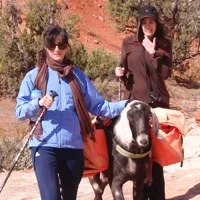 While "hiking with goats through southern Utah's Escalante Grand-Staircase National Monument," was never officially on my bucket list (most likely because I could have never conjured up such an experience in my head), after my day trek with Escape Goats outfitters, I had to add an addendum. While hiking with goats through southern Utah's Escalante Grand-Staircase National Monument, was never officially on my bucket list (most likely because I could have never conjured up such an experience in my head), after my day trek with Escape Goats outfitters, I had to add an addendum. Yes, I know what you're thinking — how could this premise possibly be enjoyable (especially if you're like me and have quite vivid childhood memories of goats getting nippy at the petting zoo)? The first reason: the scenery. The red slot canyons, the bright blue sky. It was breathtaking. The biggest reason, though, really, were the goats. To my surprise, the company of the two friendly goats ("Nubs," a Nubian breed, and "Stubs") was so comforting, it took my mind off the fact that my legs were getting pretty tired from traipsing up and down some sizable hills on the five mile hike. Not to mention, they carried a light lunch for us. Who could complain about that? Then, there's the workout aspect. You get the animal company of horseback riding, but you're just as active as your creature compatriot. A win-win. So if you're an animal lover like myself and want a hiking workout in a beyond scenic locale, I say "goat get 'em!"